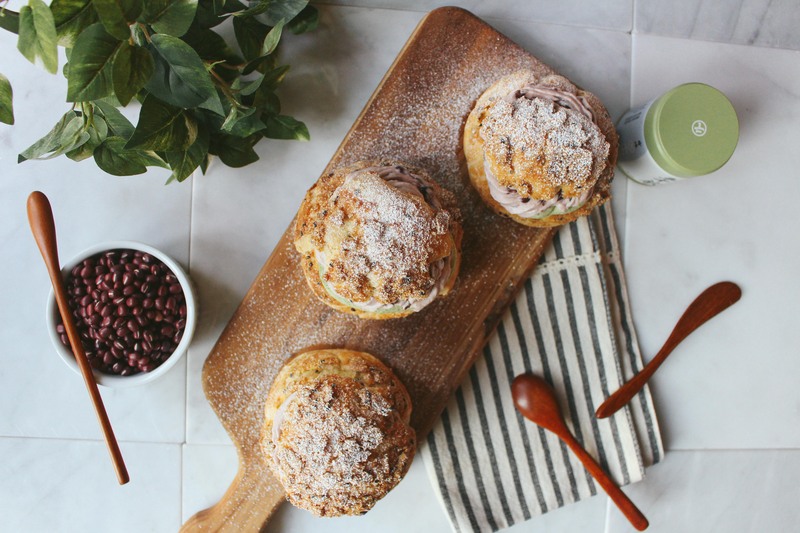 I know lately on my blog everything has been matcha-this-matcha-that when really it should be pumpkin-this-pumpkin-that, but let’s say we’re going through a matcha “module”? At school we’ve just started our respiratory module, and judging from the schedule it’s more intense than anything we’ve done (lots of prereading and prep and assessments) but at the same time it’s exciting to have everything be all integrated and fit together. started reading Man’s Search for Meaning by Viktor Frankl. I’m about halfway through it but some passages are just so stunning in how he’s able to capture the human spirit in those short anecdotes. I know already it’s going to be one of my all time favourite books. I won’t say more– just trust me on this one. 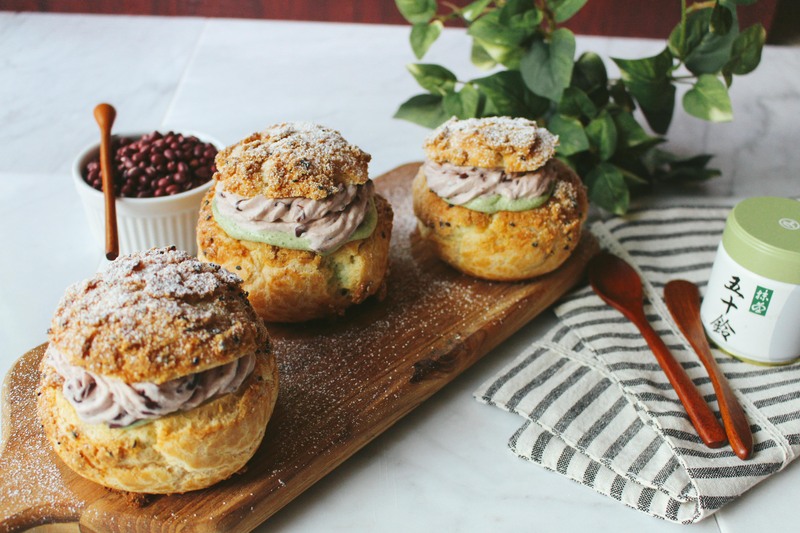 baked off these cream puffs! Look at these lil guys lined up like they’re in a kpop group. Actually, they’re not very little and are around the size of my palm… I also made some smaller ones (not pictured) that I think had a better cream-to-pastry ratio. 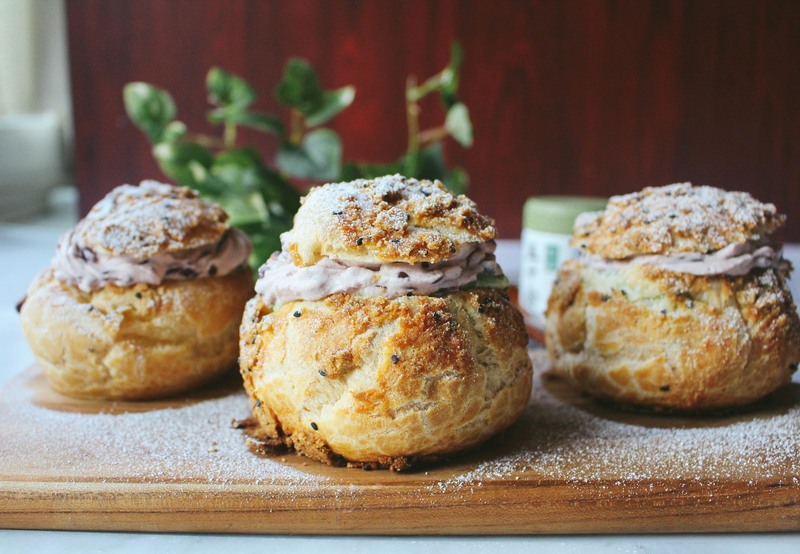 These huge puffs are basically a vessel for eating cream, so if you’re into that, the bigger the better. Otherwise, I think small ones are more manageable. They also bake up in a half-dome shape more easily too; the big ones never seem to bake entirely through. These are a test batch, and I haven’t gotten the black sesame craquelin quite right– it was dry and hard to roll out thin, so after it was done baking, it didn’t look like craquelin at all… more like someone accidentally spilled cookie crumbs all over their choux. 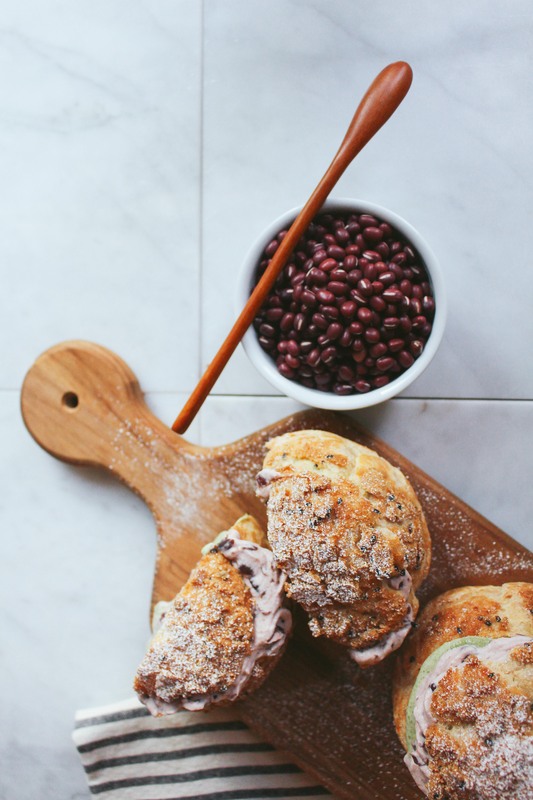 I also wanted a more obvious red bean centre, instead of this loose red bean cream. 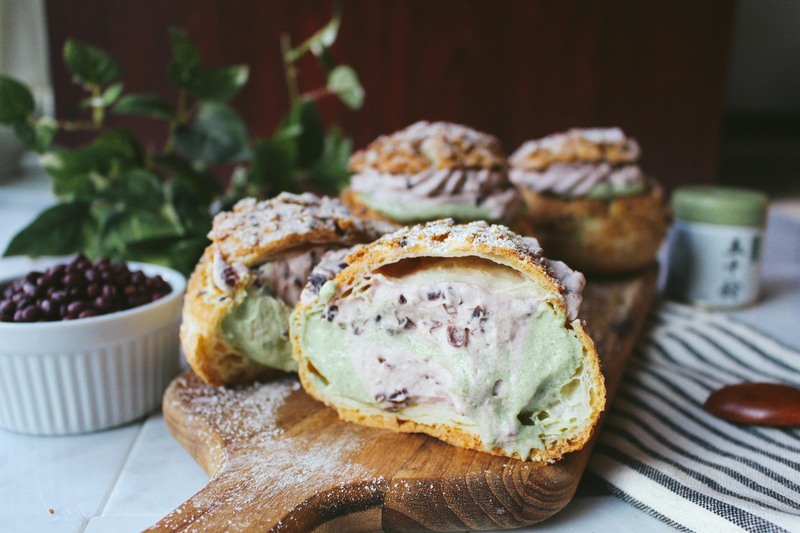 I’m thinking more along the lines of a red bean marshmallow fluff centre, or even just straight up red bean paste, surrounded by matcha pastry cream. Maybe some black sesame flour in the craquelin so it looks more Halloween appropriate. Maybe make the matcha cream less sweet and more bitter to balance out the sweetness from the red bean. I don’t know. Just ideas floating around. Anyway, I’ll post a recipe after all my experimenting– until then, take care! 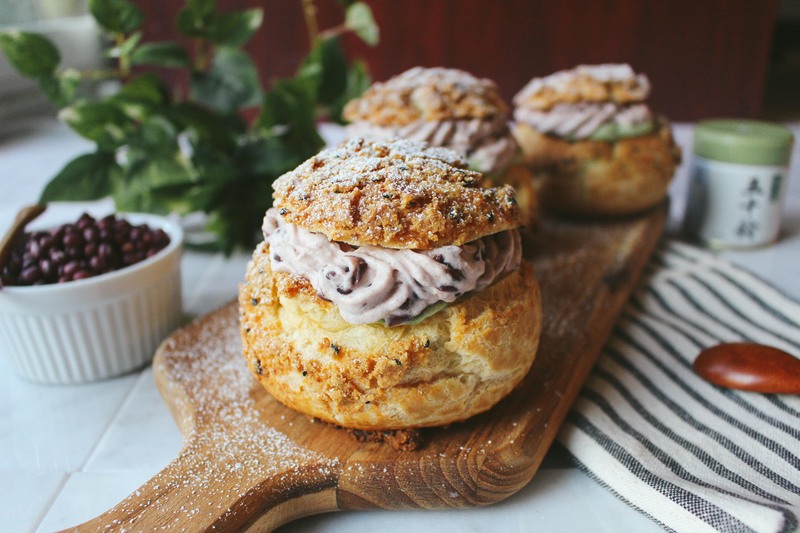 Red bean cream puffs are my favorite– a local bakery just spreads a generous layer of red bean paste on the bottom and then fills them with whipped cream. So simple, so amazingly good! 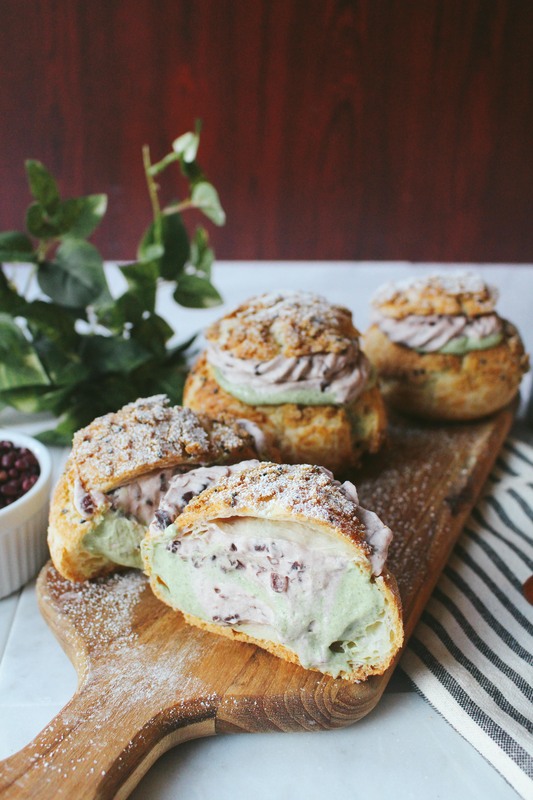 these matcha red bean cream puffs are just so beautiful.